Copenhagenize.com - Bicycle Urbanism by Design: Bike Lane to Germany Across the Sea? 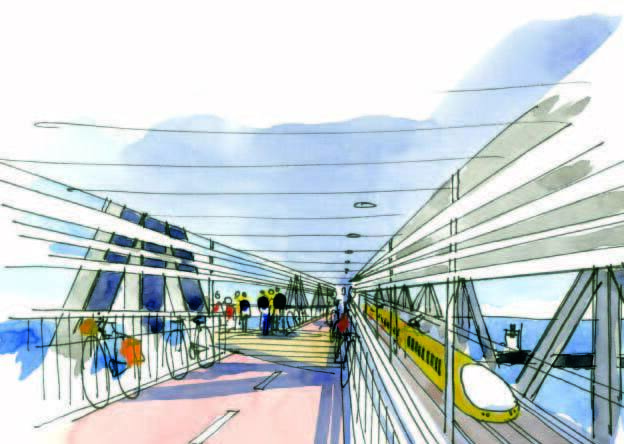 Bike Lane to Germany Across the Sea? 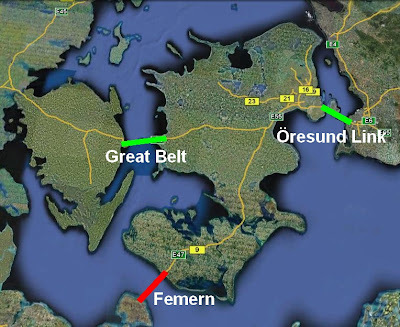 The final negotiations are underway about the proposed bridge from Denmark to Germany - the Femern Belt Bridge between the Danish island of Lolland and the German island of Fehmarn. Copenhagenize is wondering if we'll be third-time lucky. When the 17.5 km long Great Belt Fixed Link - linking the islands Zealand and Funen - was being planned in the 1990's, there was talk of adding bicycle infrastructure but it never gained any ground. 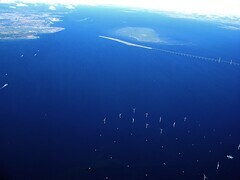 When the bridge was completed in 1998, cyclists who previously could ride onto the ferry were then forced to take the train or a bus in order to cross between east and west Denmark. 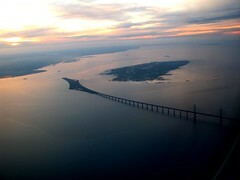 The next massive bridge project was the 15 km long Öresund Fixed Link between Denmark and Sweden, completed in 2000. Now the next project is the Femern Bridge. Once again there are voices calling for bicycle infrastructure to be added on the 19 km fixed link. The voices are louder and more insistent this time, it seems. A group of counties in the southern part of Denmark are itching for a bike path on the bridge. It would increase tourism to the region, in particular cycle tourism. Germany is a massive cycle tourism nation and while it's possible to cycle across the border to Denmark in Jutland, another route would be a brilliant addition. Here at Copenhagenize we always try to highlight the importance of bicycle symbolism in increasing the profile of cycling and emphasizing the fact that the bicycle is back and here to stay. The symbolic value of adding a bicycle path to the Femern Bridge is enormous. The existing cycle tourism market would benefit greatly and cycling over the bridge would be a tourist attraction for cycle tourists. You can see the t-shirts already; "I cycled the world's longest bicycle bridge!". I would bet you'd see Danes on cargo bikes heading across the sea to buy cheap beer and alcohol in Puttgarden, too. What a great ride. 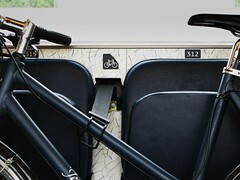 "Bicycles and cyclists are generally very courteous to their surroundings. They don't generate noise, they don't cause accidents and they have a high daily consumer rate (cycle tourists) because there are limits to how much you can carry on a bicycle. Improving the national bicycle routes will also be beneficial to the local cyclists." So what does it cost? Well, the bridge is budgetted for 35 billion kroner [€4.7 billion] and adding a bicycle path is estimated to add just 1% of that amount to the total. 350 million kroner [€47 million] for a bicycle lane 70 m above the waves with shields against the wind. For inspiration we can look to that third great cycling nation, Japan, who have bicycle infrastructure on the Innoshima Bridge. It remains to be seen whether the Femern Bridge will have bicycles crossing on it. There is only one political party backing the idea although other parties claim to be open to the idea and an analysis of the cost-efficiency, etc. We're crossing our fingers for a chance to cross the Baltic Sea on our bicycles. The third big bridge in the Danish series surely deserves bicycle paths. While we're in the neighbourhood, the idea of this bridge really pales in comparison to an idea proposed by one of our greatest architectural thinkers, Bjarke Ingels back in 2003. Creating a Baltic Super Harbour, right where this bridge will be placed. Check out the idea here. Far too visionary for modern politicians, though. Makes too much sense, too. Of course there are other great bicycle ideas whose time has come. Like... um... the Bicycle Island. Via: Danish newspaper Politiken - article Hvorfor ikke bare cykle over Østersøen? by Michael Rothenborg and own research.